Yesterday, the Supreme Court officially declined to review any of the Marriage Equality cases that had been appealed to them thus far. Declining to review means that the ruling by each appeals court is, essentially, upheld. The immediate effect was the stays against those rulings were lifted, and in five more states Marriage Equality now is the law of the land. The secondary effect is that any other states covered by one of the five Circuit Courts whose rulings were upheld will almost certainly become marriage equality states as soon as an appeal gets to the circuit. That means very soon the number of states that have marriage equality will be 30. In fact, officials in Colorado, knowing that the circuit court they are currently appealing to has already ruled against a nearly identical ban in a neighboring state, have decided to drop the appeal, and have told county clerks to start issuing marriage licenses. Now, there are several other cases that have yet to be ruled on by any circuit court, so those last 20 states may take a while. Governors of at least two of the states who lost Monday are not taking it gracefully. Most hilarious of these is Mary Fallin, governor of Oklahoma. Fallin’s righteous indignation is so funny because Fallin is a divorced adulterer. Fallin is a member of Crossings Community Church, a fundamentalist evangelical church, and her previous remarks opposing marriage equality have alluded to her religious beliefs. But Mary Fallin has no moral right to comment on the sanctity of marriage. Back in 1998, when Fallin was Lt. Governor and married to the father of her children, she had an affair with one of the state troopers assigned to her security detail. Her husband, when he found out, filed for divorce. Before the affair became a full-blown scandal, the state trooper resigned from the force. Fallin continues to deny that she had an affair, despite quite convincing evidence presented at the divorce trial. The reason all of this is important is because while nowhere in the Bible that Fallin claims is the infallible, inspired word of god, does Jesus ever say anything about homosexuality, he does talk about marriage, specifically saying that the law of the old testament which had allowed divorce under some circumstances was rescinded by Jesus’ arrival on earth. In other words, Jesus absolutely forbade divorce. And while he didn’t believe people who committed adultery should be stoned to death, be didn’t exactly approve of the cheating, either. Politicians like Fallin (or Newt Gingrinch, or Bob Barr, or John Kasich) represent the height of hypocrisy when they oppose marriage equality claiming that “traditional marriage” is “sacred” since they have violated their own church’s teaching on adultery and divorce. 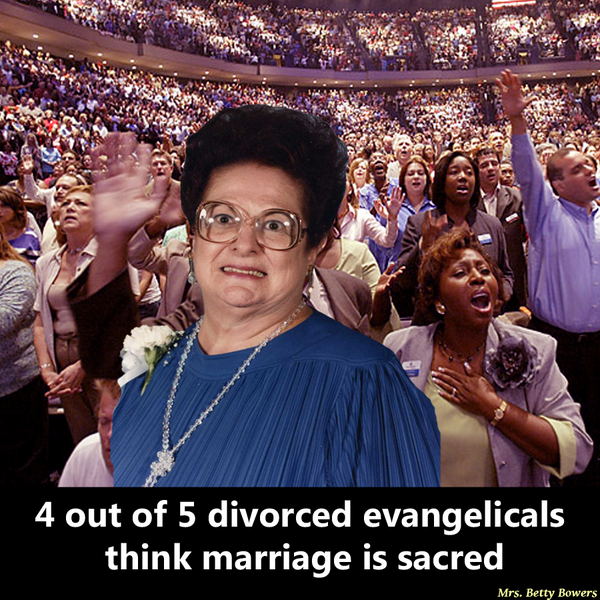 They keep saying that marriage is sacred, but they clearly have no idea what “sacred” means.